A slight growth delay of the asexual blood stages, resulting in a 'delay in the onset of parasitemia'. Normal gametocyte production (as determined by counting mature gametocytes in Giemsa stained slides). Normal exflagellation of male gametocytes. Reduction of in vitro ookinete production (52-61% compared to wild type). the mean number of oocysts in mutant infected mosquito was ~10% of the mean oocyst number seen in wild type infected mosquitoes. The mutant oocysts produced viable sporozoites that were infectious to mice. Evidence is presented for normal growth of blood stages but reduction of cerebral complications in C57Bl6 mice that are susceptible to ECM (Experimental Cerebral Malaria). 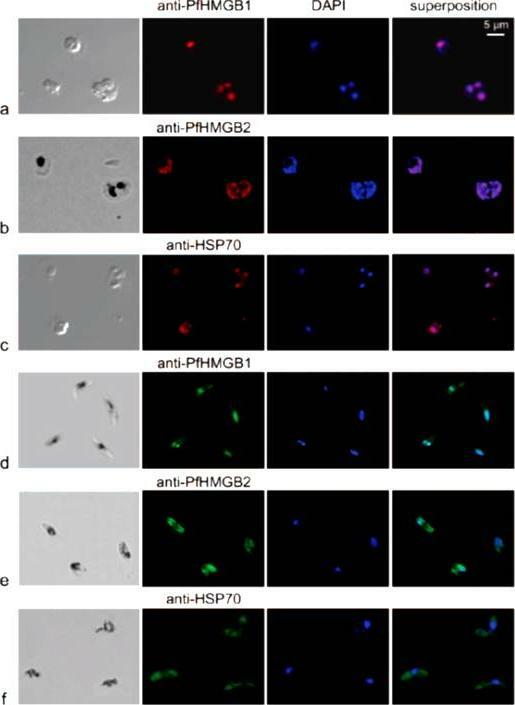 Localization of PfHMGB1 and PfHMGB2 in 3D7 Plasmodium falciparum parasite. mmunofluorescence in ring, trophozoite and schizonts of P. falciparum with anti-HMGB1 [A] and anti-HMGB2 [B] using IFA and confocal microscopy were analyzed. In column I, staining with anti-HMGBs is shown, while in column II staining with DAPI, column III merge of staining with anti-HMGBs and DAPI, column IV, merge of staining by anti-HMGBs and DAPI with the bright field of the corresponding parasites is presented. Column V, confocal images are shown. Uninfected RBCs were represented with arrowhead, where no fluorescence signal was observed. Both gene products were present in the nucleus at the ring stage . However,significant amount of these proteins were also present inthe parasite cytosol at the trophozoite and schizont stagesKumar K, Singal A, Rizvi MM, Chauhan VS. High mobility group box (HMGB) proteins of Plasmodium falciparum: DNA binding proteins with pro-inflammatory activity. Parasitol Int. 2008 57(2):150-7. Immunofluorescence localization of PfHMGB1 and PfHMGB2 in asexual (a, b, and c) and sexual (d, e, and f) stages of Plasmodium erythrocytic development. Paraformaldehyde-fixed parasites were labeled with mouse anti-PfHMGB1 and anti-PfHMGB2 antibodies (1:200) and FITC-conjugated anti-mouse IgG (1:100); DNA was stained with DAPI (1:100). Merged fluorescent signals are shown in the “superposition” column. Cells were visualized by phase-contrast (a and c) or transmission (b, d, e, and f) microscopy. Panels: a, trophozoites; b, trophozoite and schizont; c, trophozoites; d to f, gametocytes. Anti-PfHMGB and anti-HSP70 fluorescence is red for panels a to c and green for panels d to f. We also compared the localizations of both factors in asexual (red immunofluorescence) and gametocyte (green immunofluorescence) stages. As already mentioned, the two PfHMGB factors (lanes a and b) appeared to be located mainly in the nucleus of the asexual stages (rings, trophozoites, and schizonts), whereas the HSP70 protein (lane c) was also found in the parasite cytoplasm. 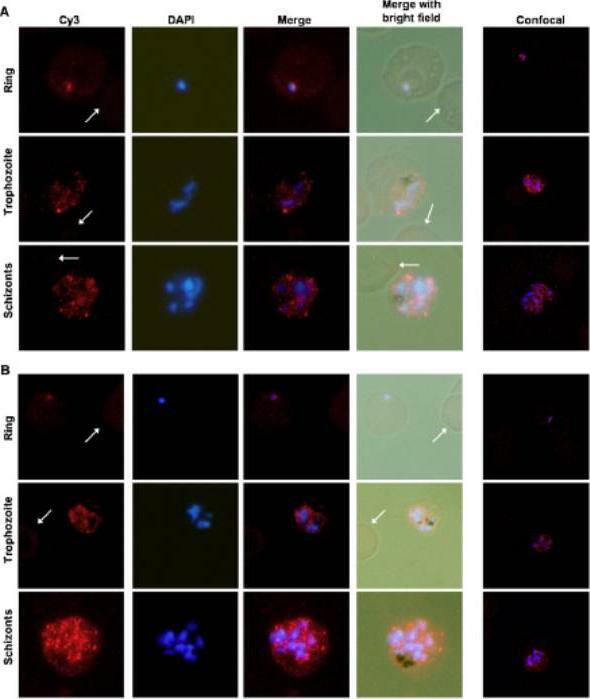 Surprisingly, in addition to its nuclear localization, PfHMGB2 could also be readily detected within the cytoplasm of different stages (IV and V) of gametocytes (lanes e), as also observed for the HSP70 protein (lane f), whereas PfHMGB1 was associated mainly with the nucleus of gametocytes, as in asexual parasites (lanes d and a).Briquet S, Boschet C, Gissot M, Tissandié E, Sevilla E, Franetich JF, Thiery I, Hamid Z, Bourgouin C, Vaquero C. High-mobility-group box nuclear factors of Plasmodium falciparum. Eukaryot Cell. 2006 5(4):672-82.